There was a large increase in passage this morning with a constant stream of Starlings, thrushes and finches arriving from the south-east. There were around 15,000 of the former along with an excellent 210 Skylarks, three Ring Ouzels, 100 Blackbirds, 22 Fieldfares, 40 Song Thrushes, a late Yellow Wagtail, 850 Chaffinches, 18 Bramblings, 250 Goldfinches, 55 Siskins and 40 Reed Buntings. 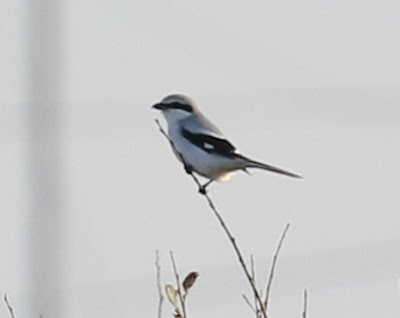 There were a few less common birds with two Common Buzzards and four Short-eared Owls of particular note whilst the bird of the day was an all too brief Great Grey Shrike which was seen by just two lucky observers before it headed off high in a south westerly direction. A few Brent Geese were passing through offshore and a Great Skua and eight Mediterranean Gulls flew east in the afternoon. A Stoat and a Brown Hare were seen.